Vice-President of the European Commission Mr. Jyrki Katainen, emphasised the role of support for young entrepreneurs. Conference attracted over 100 participants from all over Europe to discuss and learn about findings and experiences from the first two years of the iEER Interreg Europe project. Helsinki-Uusimaa Regional Council coordinates the iEER Interreg Europe project which organized its midterm conference on 22–23 March in Brussels. In the iEER conference, some tangible results of the project, such as an interactive eHandbook, were introduced. For developing a well-functioning entrepreneurship ecosystem, the iEER panellists called for more focus and policy attention to the entrepreneurial education and mindset activation in early childhood continuing throughout a person’s learning journey. Keynote speaker, the Vice-President of the European Commission Mr. Jyrki Katainen, emphasised the role of support for entrepreneurs. For the next EU Multiannual Financial Framework (MFF), the European Commission is planning a new investEU fund. The idea is to bring the current seven different financial instruments for SME under a single umbrella. 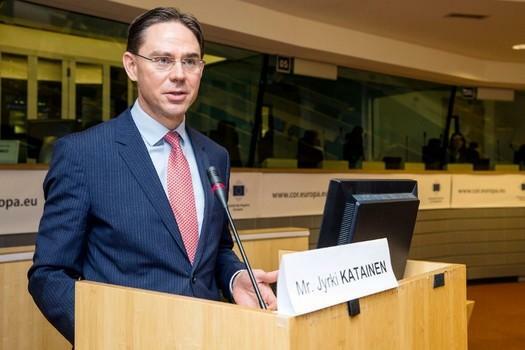 Furthermore, the Commissioner Katainen encouraged cities and regions to take actively part in the current negotiation process of the MFF and to bring ideas how to effectively use EU funds beyond 2020. Katainen called upon the participants not to leave the MFF only to the national governments as regions’ voices are needed. The conference was concluded with a signatory session. High level representatives from each of the iEER region signed a distinguished regional iEER action plan. The ten regional actions plans amounts to a total of 50 actions in developing and implementing entrepreneurships support and policy in the iEER regions during 2018-2020.